The Hetch Hetchy Railroad was a 68-mile, standard gauge railroad constructed by the City of San Francisco to support the construction of the O’Shaughnessy Dam across Hetch Hetchy Valley. Based in Groveland, the HHRR operated from 1917 to 1949. It primarily carried construction crews and materials, but also took excursion passengers, freight, and mail. The line extended from its western terminus at Hetch Hetchy Junction (a junction with the Sierra Railroad at Sierra milepost 26), to its eastern terminus at about 3,800 feet elevation on the rim of the Hetch Hetchy Valley above the construction site. Hetch Hetchy Railroad management went to A. Meister & Sons of Sacramento in 1919 to order a car built on a White Motor Company standard truck chassis. In 1920, the unique pony truck and rail brakes were installed and a self-contained turntable was mounted by the San Francisco Municipal Railway. No. 19 could carry thirteen passengers, but was primarily outfitted as an ambulance car during Mountain Division construction carrying injured and dead to the hospital in Groveland. With its self-contained turntable under the floor it could be jacked up and turned anywhere along the railroad. No. 19 turned out to be the favorite of Hetch Hetchy Project Manager, Chief O’Shaughnessy, who always requested it when he was up from San Francisco on business or inspections. The track car was originally decorated with red and black paint, ornamental tassels and gold lettering and numbers. It could run on track at speeds as high as 50 mph, running in overdrive on the straight stretches at Buck Meadows and Smith, getting sixteen miles per gallon. No. 19 set the trend; five more track buses were purchased, all White’s and no two exactly alike. For 32 years the No. 19 sat in retirement at Moccasin. Tracks were already being removed by scrappers. It was saved through the efforts of a Modesto resident, Al Rose – rail fan, author and photographer. Al purchased the car and had it stored at a museum near Modesto until such time as the Yosemite National Park found a place for it in the Transportation Museum at El Portal next to the Hetch Hetchy Shay No. 6. No. 19’s mechanical parts were fully restored to operating condition by the White Motor Company just prior to placing it in the museum.Removal of rust on and around the doors, motor and radiator brought into working order for track service, interior was completely reupholstered, canvas roof and window shades were repaired/replaced and a new canvas stretcher was added. After many years at the El Portal Museum, a screened outdoor structure, Al reclaimed the No. 19. It was placed in storage and shortly thereafter Al Rose past away. In July 1997, Helga Rose, Al’s widow, donated No. 19 to Railtown 1897 State Historic Park. 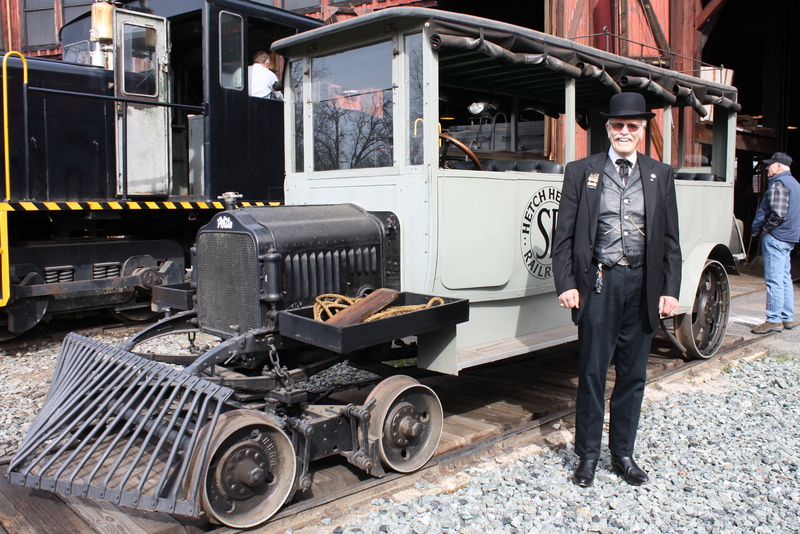 A restoration team from Railtown inspected the car and brought it to Railtown’s roundhouse using a low-boy truck. Today, the Hetch Hetchy Railcar #19 is on display inside the roundhouse at Railtown. The San Francisco Public Library has historic photos of the #19, and other Hetch Hetchy cars, in their online collection. Thanks to Joe Sparagna for contributing to this article. This entry was posted in Equipment, History. Bookmark the permalink.